Safety is the number one thing to keep in mind on moving day. To prepare for any eventualities that may arise, put together a moving first aid kit in advance. If all goes well you won't need it, but your kit should be on hand just in case. 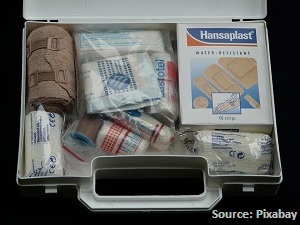 Be ready for anything and everything that may occur during your move when packing your first aid kit. Over the counter medicine to alleviate pain, allergies, stomach problems, etc. Don't shell out the money for a fancy waterproof first aid case that will eat into your moving budget. Simply put it together yourself using individual sandwich bags inside a zip-lock bag or plastic storage container for protection. Compartmentalize the contents of your first aid kit by item type. Medicine in one bag, things for cuts and scrapes in another, etc. Since you cannot predict when or if accidents will occur, place the first aid kit you have put together in an area where everyone has access to it. Depending on the season (be it winter, spring, summer or fall) you may want to switch around the contents of your first aid kit. For example. if it's extremely hot out, pack sunscreen and bug spray to try and solve problems before they start, along with aloe and anti-itch cream if prevention doesn't work. In this same vein, consider heat packs during the chill of winter to avoid frost bite and to lengthen the amount of time your body will be able to withstand the cold. Of course, in order to avoid accidents occurring in the first place, you and your movers should be practising important safety tips at all times. Wear the correct clothing to avoid getting clothes caught, tripping, dropping things on body parts, creating blisters, etc. It's important to be prepared for any eventually because injuries may arise on the day of your move no matter how safe you are. However, should the injury be something particularly serious that you cannot handle, do not hesitate to take the injured party to get proper medical treatment.